Sýningaropnun í Nuuk – Angerlarsimaffik! Farandsýningin HEIMA opnar í dag í menningarmiðstöðinni KATAUAQ í Nuuk á Grænlandi! ARKIR eiga fjölmörg verk á sýningunni en listamenn frá öllum Norðurlöndunum sýna verk undir þemanu heim eða heima. Prímus mótor og sýningarstjóri er Hanne Matthiesen sem segir frá í máli og myndum hér á heimasíðu norræna CONTEXT-hópsins. 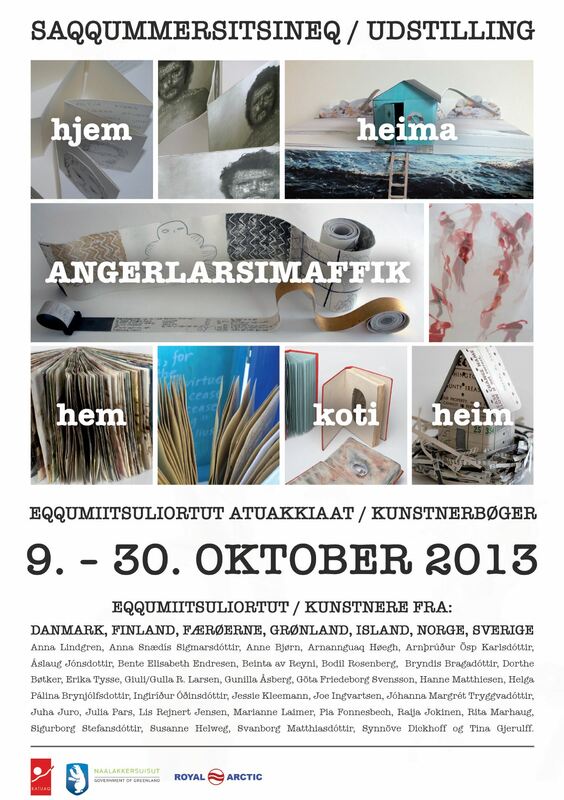 The touring exhibition HOME is opening today in KATAUAQ Culture Center in Nuuk in Greenland! Exhibition manager Hanne Matthiesen writes and posts photos from the preparations here at the CONTEXT-Art Group’s blog. ARKIR are cheering in Iceland and send their best wishes to fellow book-artists in Nuuk!